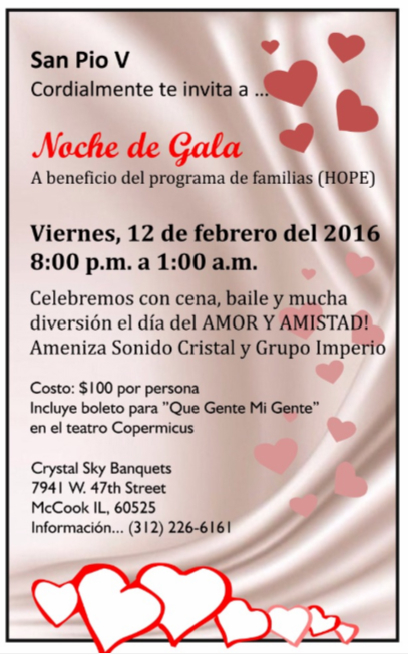 Friends of St. Pius V can enjoy an evening out and support St. Pius V Parish’s family counseling program by attending “Noche de Gala” at 8:00 p.m., Friday, February 12, 2016 at Crystal Sky Banquets, 7941 W. 47th Street, McCook, IL 60525. The inclusive package includes dinner, dancing, drinks, fun activities, and admission to another theater event* this month for a donation of $100 per person. Parking is free. All are welcome! Funds raised will support the parish-based family counseling program, HOPE at St. Pius V.
For information or tickets call 312-226-6161. *We are pleased to partner with Family Bridges in their production of “Los Secretos de Santa Mónica,” February 17-21 at the Athenaeum Theatre in Chicago. One ticket to our Valentine’s Gala also gets one person into a showing of this wonderful stage production!